In the previous post I made a General Election Seat Forecast based on the massive YouGov regional opinion poll published on May 15. Based on a uniform swing in all seats in a region, this would have given the Conservatives a majority of 128. This was slightly below other forecasts, but still a substantial majority. In the past week, following the publishing of the Labour and Conservative Manifestos, the polls have swung substantially. The Sunday Times / YouGov weekly poll, published yesterday (21 May) gave Con 44 (-2), Lab 35 (+6), LD 9 (-2) and UKIP 3 (-3). YouGov today have published an opinion poll for Wales, giving Con 34 (-7), Lab 44 (+9), LD 6 (-1), Plaid Cymru 9 (-2) and UKIP 5 (-1). All the changes are with respect to the regional opinion poll. These are quite large changes, by still leave the Conservatives with a nine point lead over Labour. Surely this will still leave a fairly comfortable majority? A recalculation on the same basis gives quite a startling result. Figure 1 gives summarizes the General Election Result of two years ago. The 330 seats gained by the Conservatives (plus 1 for the Speaker) gives a small majority in a 650 seat Parliament. As Sinn Fein never take their seats, this gave a small majority of 14. This with 37.7% of the vote (excluding Northern Ireland). Surely with 44%, the Conservatives should do significantly better? Figure 2 gives my recalculations, based on the latest opinion polls. Conservatives (including the Speaker) see an increase of just 7 seats for 7% more of the popular vote. Labour see an increase of 2 seats for 5% more of the popular vote. The Conservative majority doubles to 28 seats. Figure 3 shows where the parties gain seats. Very few seats change at all change under this forecast. 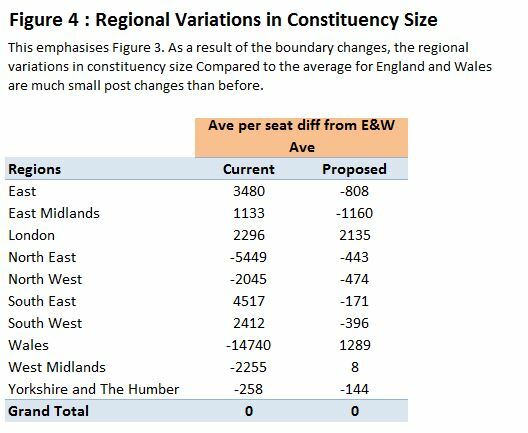 Four regions see no seat changes at all. In three regions the Conservatives lose seats to Labour, and in London they lose two seats to the Lib Dems. The increased majority is reliant on the gains from the SNP in Scotland. Stemming the tide of the Scots Nats (who in the last year have been a more effective opposition than Labour) might alone be worth calling a General Election. Whilst a small majority would severely weaken the Brexit negotiating stance, for Labour under Jeremy Corbyn to poll significantly better than Ed Miliband in 2005 and Gordon Brown in 2010, would mean that he could retain power. The Labour Party would still be condemned to being a weak opposition under Corbyn, and the hard left would be able to consolidate their power. Now there are some points that will likely give Theresa May a larger majority on June 9th. First, the forecast I made last week gave a lower Conservative majority than the more sophisticated forecasts. Uniform swing does not allow for local battles. The Tories have more enthusiasm compared to a deeply divided Labour Party. Second, the Labour Manifesto was well received in parts, but the larger picture of financing was based on some fairly implausible assumptions. The Conservative manifesto was weak in parts but was mostly more of the same. As a result it seems Labour may have peaked, and the Conservatives are having a wobble. Third, the Conservative election machine is far more formidable than the Labour one. Once they re-focus the debate on twin themes of leadership and Brexit, the Conservatives are the more likely to gain ground. Fourth, the last minute scare tactics will work against Labour. Expect the last Conservative Party Political Broadcast to feature Jeremy Corbyn’s qualities and past associations. Conversely Labour’s usual “24 hours to save the NHS” tactic has already been anticipated. Since the EU referendum, the Labour Party has been split asunder. 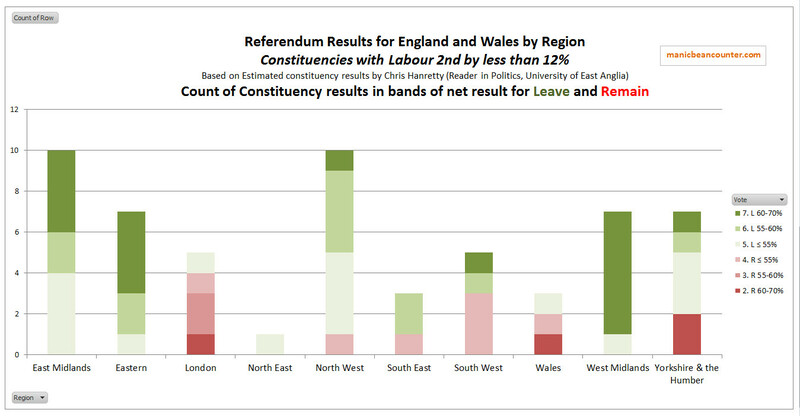 Most Labour constituencies voted to leave the EU. But the current leadership, and many of the supporting activists, are from very pro-Remain areas, particularly London. The draft Labour Manifesto, that was widely “leaked”, shows how this split in its support has been circumvented. First, the key issue of the the country at present is downplayed. 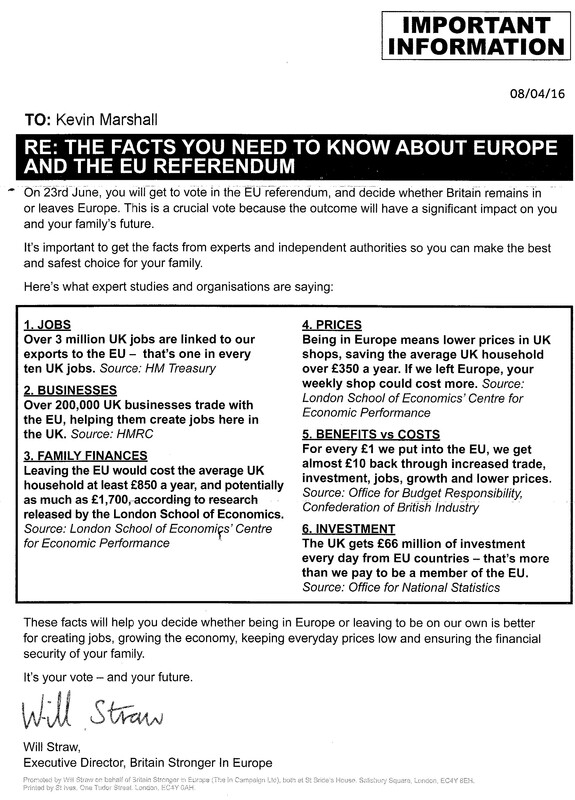 The section Negotiating Brexit is only the ninth item in the manifesto. Second, is to stop some laws being passed from EU control to UK control. Third, is to give Parliament the final say at the end of the process, including the possibility of remaining in the EU, or applying for re-admission. In so doing, Labour is alienating the majority of its traditional core support. That it is the poorer and more marginalized in society – where traditionally the Labour Party draws its major vote – that disproportionately voted to leave the EU. Lord Ashcroft then asked for people to rank in order a number of factors in people’s decision. His graphic is reproduced below. 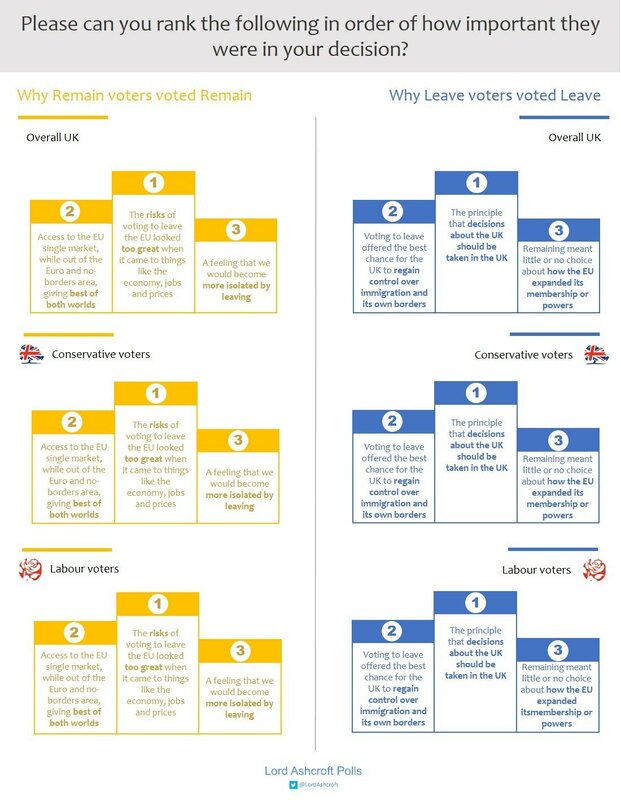 An analysis of the Leave vote by political party shows that of around two-thirds of those voted Labour in 2015 a year later voted to Remain in the EU. Yet around two-thirds of those who traditionally formed the bedrock of the Labour vote voted for Leave. This is not a contradiction in the figures, but the fact that the Labour Party is no longer reaching most of the core group that it has traditionally represented. Geographically this is illustrated in by my breakdown from last July of Chris Hanretty’s estimates of the EU referendum results by constituency. With respect to Labour-held seats the proportions by region were as follows. 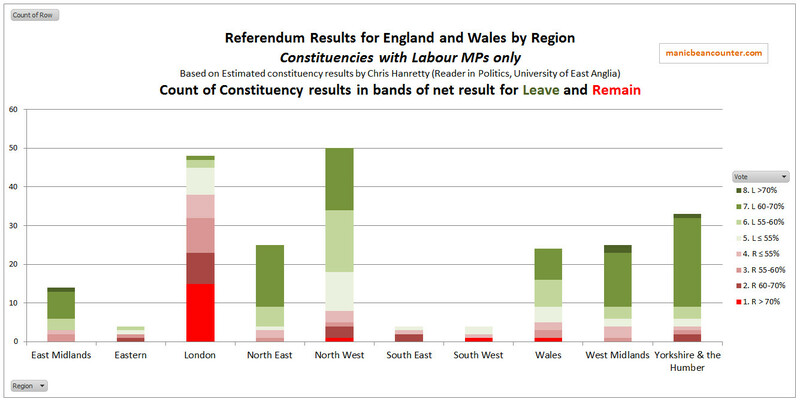 In London, Labour constituencies included some of the most pro-Remain areas of England. 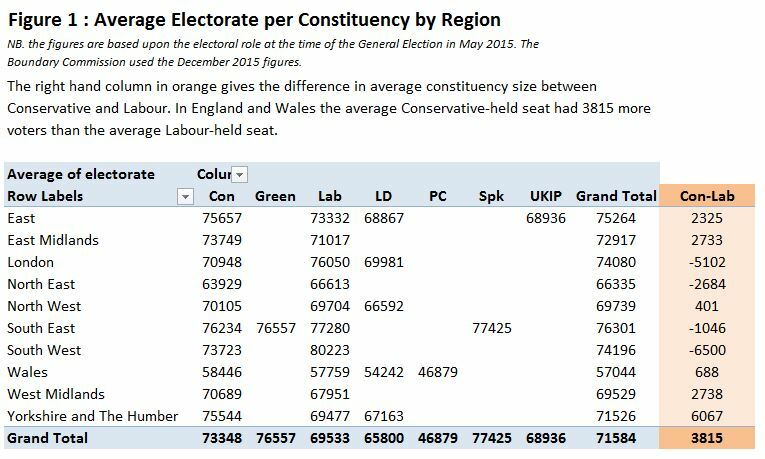 Yet Labour seats elsewhere included a disproportionate number of some of the most pro-Leave constituencies in the country. In terms of proportions, 40% (231 of 574) constituencies in England and Wales were Labour after the 2015 General election. Yet over half of the constituencies with a greater than 60% Remain vote (34 of 54) were Labour. 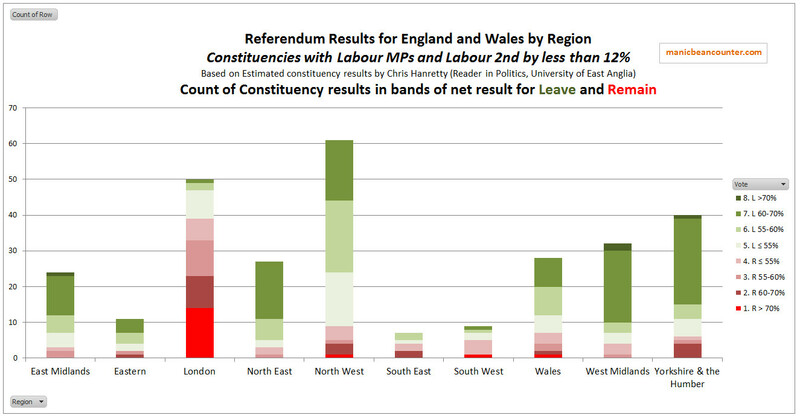 Also over half of the constituencies with a greater than 60% Leave vote in England and Wales (89 of 168) were Labour. But, for the Labour party the extreme “Leave” seats are over 2.5 times the extreme “Remain” seats. To tip the balance even further, for Labour to progress on their poor showing in the last election, they must win target seats. Of those seats where Labour came second by less than 12% of the vote, there are 17 seats that were over 60% “Leave” and just 4 seats over 60% “Remain”. Since the EU Referendum, opinion has changed. The most recent poll by YouGov on Brexit, published at the end of March, found that overall the public think Brexit should go ahead by 69% to 21%. This includes people who voted Remain, but think that the expressed will of the British people should be enacted. an emphasis on its core voters. an emphasis on returning decision-making powers back to the UK. a geographical targeting of the Midlands, the North and Wales, where its power base lies. trying to represent the opinion of the vast majority. discrimination towards the people the Labour Party was formed to serve (the working class and the marginalized) over the middle class intellectuals. The draft manifesto was widely circulated. The best available format is at Guido Fawkes. The title of the manifesto slogan – “For the many not the few” – seems to be a good start. If Labour is looking towards the vast majority, it will surely not favour the opinions of the minority over the much larger majority? This is not the case. Despite being the major issue facing Britain today, and the major reason the General Election was called, the section Negotiating Brexit is only ninth. The authors give greater priority to Industrial Strategy, A National Investment Bank and Sustainable Energy. So rather than concentrate on the pressing issues of the day, we are taken back to the disastrous ideas of the 1970s, along with a country unilaterally trying to save the planet from fictitious threat of catastrophic anthropogenic global warming. They manifesto proposes changing the approach to Brexit, despite the tight timetable. Further, in talk of protecting certain laws, the manifesto is of activist protesters wanting to stop changes in the post-Brexit process. The Great Repeal Bill is inaccurately named as it is just quickly converting EU law into British law within a tight timetable. It is afterwards that laws deemed harmful to Britain by the democratically-elected Government will be scrapped or radically altered. Maybe crackpot Marxist conspiracy theorists, or those who view reality through the distorted prism of received collective opinion, think otherwise. But then in a truly independent United Kingdom, there is the opportunity to win power and reenact laws and policies that have been scrapped. That is no different from many areas today, as is seen by the draft manifesto sections on Nationalisation and Industrial Strategy. But the draft manifesto is implying that certain contentious areas of law that the Labour leadership value highly should remain beyond the remit of UK lawmakers. However, the most important is final sentence in the section. This means that it is Parliament who have the final say on that deal. But what if the majority of MPs decide to reject the deal negotiated at the end of the budget process? Well that will mean either leaving the EU without a deal; or trying to stay in the EU; or reapplying for membership. This latter option will not in the real world actually happen, but neither the manifesto, nor Labour leader Jeremy Corbyn in a recent interview with the BBC’s Laura Kuessenberg, have categorically excluded this scenario. Indeed, given Labour would slow down the process, there would be insufficient tine for meaningful negotiations to take place. The “deal” will be little altered from the negotiating stance the EU starts out with. This will be unacceptable to Parliament, and the WTO terms are clearly unacceptable to Jeremy Corbyn. Therefore, there would be a hurried reversal of the process, with the UK having to grovel to be re-admitted on worse terms than before. Why not state Britain is leaving the EU? The reason for Labours’ evasions is that the leadership of the Party, the activists that support it and the unions that finance the Labour Party all want to remain in the EU. The strongest support for Remain in England and Wales is concentrated in London. This is also where the disproportionate number of hard left activists reside and where the key four leaders – Jeremy Corbyn, John McDonnell, Diane Abbot and Emily Thornberry – were MPs in the last Parliament. By leaving open the possibility of remaining in the EU, despite the vast majority now accepting the opposite, Labour are trying to have it both ways. They can both appear to be opposing Brexit to their core supporters and appear to be enacting Brexit to their traditional base. But in so doing abandoning most of their traditional core supporters in Wales, the Midlands and the North, the people will either not vote, or (if the latest opinion polls are anything to go by) vote Conservative.